Cash Buyers Squeezing Out Traditional Home Seekers About one-third of all home purchases these days are made in cash — far above normal. Some of those buyers are investors who crowd out people who want to buy the traditional way: with a mortgage. But cash buyers are also helping to mop up the huge inventory of foreclosures around the country. Millions of homeowners ended up "underwater," with their homes worth less than what they owe. Not everyone wants to buy a mold-infested foreclosure, but Dan Grohs does. He and his Realtor are walking through a three-bedroom house in Minneapolis. The copper pipes have been stolen by vandals and the heat doesn't work, but Grohs recently bid on the house — and he sees potential. "It's got a nice flow to it," Grohs says as he moves through the home. "You walk in — living room, dining room, kitchen. Good spacious rooms." The bank that owns this foreclosure wants about $48,000 for it, but Grohs has offered $40,000 in cash. If the deal goes through, he plans to renovate the house and resell it. That's how he and his brothers make a living, and Grohs says they've probably made more than 500 cash deals over three decades. In the past two years, many more investors have been doing the same. Thirty-four percent of completed home sales in January were paid for with cash, according to Campbell Surveys and Inside Mortgage Finance. That share has picked up from just a couple of years ago, and is far above the 10 percent range typical in a more normal market. Sometimes cash buyers are people who want to occupy a home. But more often, they're investors. And one reason for cash buyers' interest is somewhat unexpected, says Tom Popik, research director at Campbell Surveys. He says it has to do with the Federal Reserve's promise to keep interest rates low for a long while. 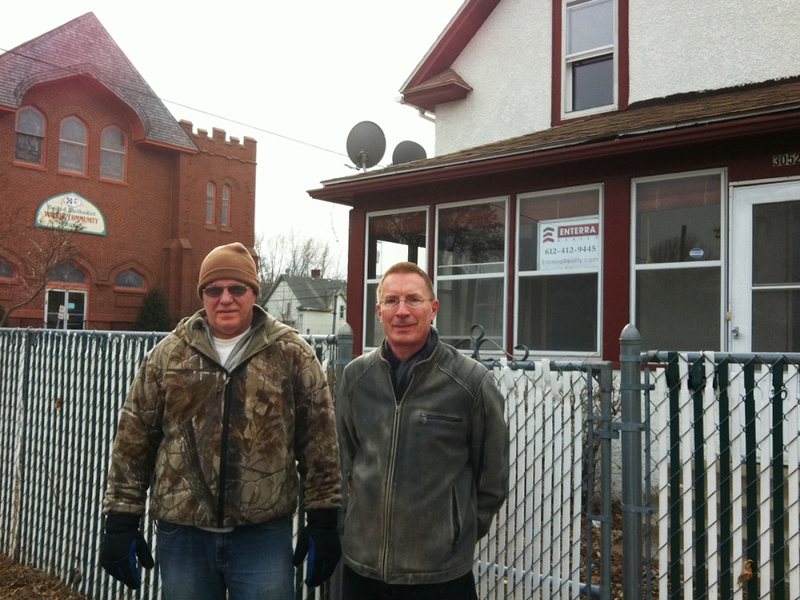 Dan Grohs (left) with real estate agent Pat Paulson in front of a foreclosed Minneapolis home. Grohs hopes to buy the house with cash. "I think a lot of people are throwing in the towel and deciding they would rather invest in real estate than have their money in a deposit account in the bank," Popik says. He says that, theoretically, those low interest rates should be enticing more traditional homebuyers to get mortgages. But these days, it's much harder for those prospective buyers to qualify. 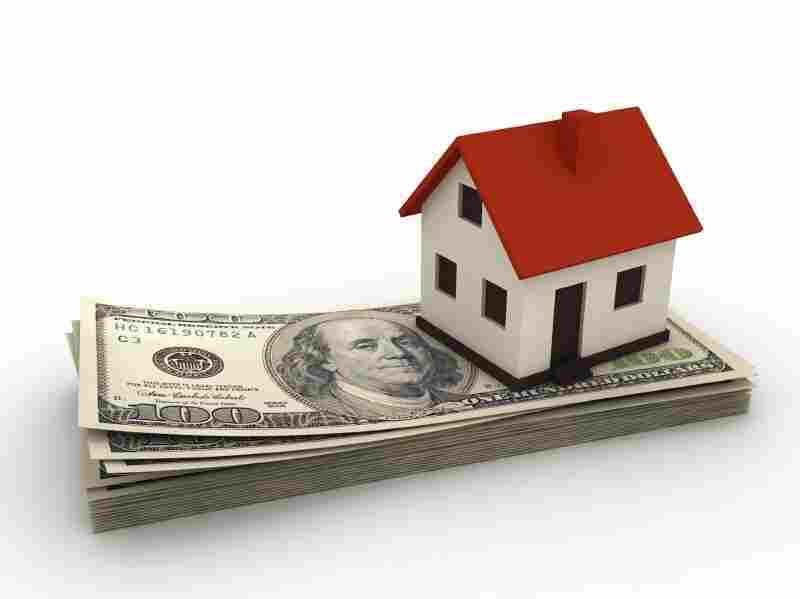 In contrast, cash buyers don't have to deal with a lengthy loan approval process, or even an appraisal. That more streamlined process appeals to banks that own or service foreclosures and want to unload them. Bob Davis, executive vice president of the American Bankers Association, says "that's why [a bank] might turn down a higher purchase price made by someone they feel has a questionable ability to get the mortgage." At the end of the day, Davis says, a bank is looking to get rid of its foreclosures and will probably have to book them as a loss no matter what. Cash buyers can help a bank take its lumps more quickly. "It's all about the calculation of which buyer will result in the most loss mitigation to the bank," Davis says. But the steep discounts cash investors want are pushing home prices down overall. Surprisingly, that's fine with Richard Green, a professor at the University of Southern California's Lusk Center for Real Estate. He says any depressive effect that cash buyers have on prices is probably worth the trade-off — because they're also eating into the overhang of foreclosures. "These cash buyers are mopping up inventory, and that's probably the most important thing that can happen right now," he says. "You're not going to see a recovery in prices until inventories return to more normal levels." And, Green says, inventories are starting to stabilize. Meanwhile, Grohs believes he's doing a lot of good for the Minneapolis neighborhoods where he's investing, which are typically dense with foreclosures. "Any time you can take a house that's boarded, vacant, and/or condemned, fix it up nice, and then it's occupied — I just believe that it has to stabilize and improve the neighborhood," Grohs says. And naturally, it doesn't hurt that Grohs turns a tidy profit along the way: He says he pulls in at least $100,000 a year.